The Lukari Restoration Initiative represents their attempts to utilize Protomatter to undo damage dealt by the Tzenkethi. Their expertise in using Protomatter, combined with their sustainability doctrine and scientific focus, has resulted in an approach to exploration that revolves around leaving the universe a better place for all those who share it. This new reputation will be available with Season 12’s release and will feature all new traits, kit modules, space equipment sets and a ground equipment set. Submitting Lukari Marks will increase your standing with the Lukari Restoration Initiative. 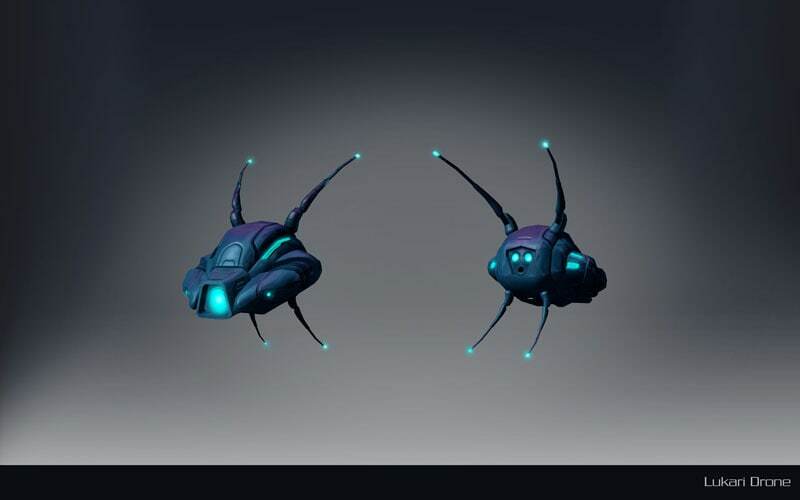 These can be earned by participating in the “Gravity Kills” and “Tzenkethi Front” queues, as well as the Tzenkethi Battlezone. Each source of marks allows for scaling rewards, increasing the number of Lukari Marks received by performing above expectations or completing bonus objectives. Protomatter Microcontainers can be earned by participating in the Advanced and Elite versions of queues which reward Lukari Marks, as well as completing significant events within the Tzenkethi Battlezone. Protomatter Microcontainers hold trace amounts of Protomatter, used by the Tzenkethi for making Protomatter bombs. Because Protomatter is notoriously unstable, the Tzenkethi usually keep it in small, isolated quantities. Allied forces encourage collection of Protomatter for safe disposal. High-end gear projects will require a small number of Protomatter Microcontainers to claim the best equipment the Lukari Restoration Initiative has to offer. The Lukari Restoration Initiative will also exchange Protomatter Microcontainers for Dilithium Ore.
Lukari Restoration Initiative Deflector Arrays are designed to enhance a ship's ability to be a combat-ready support vessel. They vastly increase the Hull and Shield Restoration capabilities of ships and additionally provide resistance to Radiation Damage and enemy drain effects, while increasing outgoing drain effectiveness. Lukari Restoration Initiative Combat Impulse Engines are especially reactive to the state of their ship; they come standard with additional kinetic resistance and additionally grant a mobility and regeneration buff when your hull suffers excessive damage in a short duration. Lukari Restoration Initiative Regenerative Shield Arrays are adapted to have extra resistance to Tetryon damage. They additionally have enhanced shield emitters that cause them to heal nearby allies’ shields passively, in addition to their own. Matter / Antimatter Core: Lukari Restoration Initiative Warp Cores are designed to overcharge auxiliary and shield power levels, increasing a ship’s maximum and current Auxiliary and Shield power. The warp core also gives bonus Shield power based on your current Auxiliary power level, increasing the shield defense and regeneration strength of ships. This warp core is additionally equipped with Point Jump technology, which allows it to move to a point in front of a friend to heal them, or in front of an enemy to attack. 10% Recharge Time reduction on Hull and Shield Healing Bridge Officer abilities. Regenerative Shield Overflow (Set Shield Passive) Range increased from 2.5km to 5km. Point Jump Reduced Recharge to 120 sec and Gain Temporary Hit points for 10 sec. Foes within 5km: receive a penalty to Shield Hardness for 10 sec. The Piezo-Electric Focuser Universal Console utilizes advanced technology to generate Piezo-Electric power from the natural vibrations of the ship and boost the efficiency of various parts of your starship. Slotting this console grants an increase to Polaron damage, turn speed, and maximum shield capacity. The Advanced Piezo-Photon Torpedo Launcher has been heavily enhanced, with different effects under different firing modes. This torpedo prevents Tzenkethi ships from creating Protomatter Radiation Hazards on death for 10 seconds after impacting them. When fired normally, or as a transported warhead, it has a chance to inflict a shield hardness debuff and shield drain on nearby foes. When fired as a salvo, or with the photonic shockwave upgrade, it drains and debuffs the hardness of your enemy's shields in a massive area around your primary target. When fired as a high yield torpedo, the launcher fires one single destructible torpedo that deals heavy kinetic damage to your main target, inflicts a shield hardness debuff and bigger shield drain to all foes in range, and additionally deals shield-bypassing electrical damage to all foes in range. Beam Array: The Advanced Piezo-Polaron Beam Array has a chance to heal you and nearby allies for a percent of their hull and shields over time. Additionally, when first activated while Beam Overload or Surgical Strikes are active, this weapon triggers a Technical Overload on the target that deals electrical damage in an area around the target that is increased if the target is electrical. Dual Heavy Cannons: The Advanced Piezo-Polaron Dual Cannons have a chance to heal you and nearby allies for a percent of their hull and shields over time. Additionally, when first activated while Cannon Rapid Fire or Surgical Strikes are active, this weapon triggers a Technical Overload on the target that deals electrical damage in an area around the target that is increased if the target is electrical. 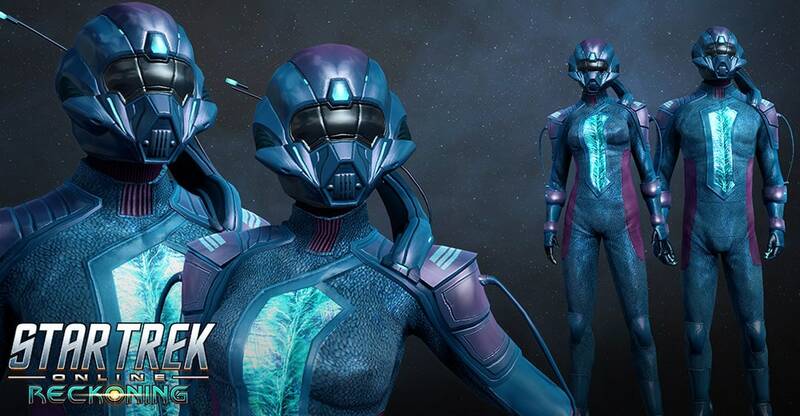 Lukari Proto-Restorative Combat Armor is the result of Lukari scientists compromising on an exploratory, peaceful policy in the face of a dangerous threat. The armor comes equipped with active regenerative properties and advanced adaptive engineering for encounters with enemies of similar technological prowess. As with all Lukari technology, the Lukari Proto-Reactive Personal Shield is designed to be adaptable. Powered using refined Protomatter energy harnessing techniques, the Lukari have made a highly regenerative shield. Also equipped within the shield projector is a countermeasure for when power reserves drop significantly. The shield will disperse a Protomatter regenerative field so that the wearer and nearby allies can be saved in the case of sudden, unexpected dangers. The Lukari have ideals which must not be lost among the conflicts of space. This lead their engineering teams to develop a wrist device that was capable of both reinforcing offensive capabilities and providing a support role if the scenario warrants it. Additionally, due to the electrical output of the device, enemy offensive and supportive electronics can be dispatched quickly and tactically. Chance when taking damage while shields are active to convert some incoming damage for a few a seconds into shield healing. The Protomatter Generator Drone Fabrication creates a mobile drone that follows the user and provides passive health and shield regeneration to allies that stand near it. Piezo-Electric Lattice will root and cause electrical damage over time to the target and up to 4 other nearby targets. Affected targets may also suffer from a weapon malfunction for a short time. This duration is doubled against Electrical targets. Throws a grenade at the target. The grenade explodes on contact, dealing area of effect kinetic damage as well as a high amount of electric damage over time. The Piezo-Electric Grenade also has a high chance to hold affected targets for a short time. Electronic targets are always held if struck by this grenade's blast. It is possible for the target to move away from the blast radius while the grenade is in transit. Damage from the explosion partially ignores shields, and does additional damage to electronic enemies. Gain immunity to Control effects for a short duration when you are the target of a Root, Hold, Disable or Knock effect. When you critically strike an enemy, you additionally disable their weapons. Gain immunity to Control effects for a short duration when you are the target of a Root, Hold, Disable or Repel effect. When you critically strike an enemy, you additionally take their impulse engines offline and reduce their flight speed and turn rate. Being critically hit will grant you a large increase to your health and shield regeneration rate for a short time. 10% Chance for your weapons to cause an AOE shield drain centered on your primary target. Being critically hit will grant you a large increase to your hull and shield regeneration rate for a short time. 5% Chance for your weapons to cause an AOE shield drain centered on your primary target. Piezo-Electric Perimeter Snare creates a patch of mechanical tendrils at the target, which damage and root foes. Any foes that move into the snare will be slowed. All targets caught in the patch will receive electrical burns, which deals damage over time. All Damage from Piezo-Electric Perimeter Snare partially ignores shields. This brand-new reputation will be available with the launch of Season 12: Reckoning, and will be available for testing on Tribble soon. We look forward to seeing players make the most out of these reputation rewards. See you in-game! NOTE: All abilities and items found within this blog are subject to change.